Could freedom and democracy be returning to Burma? After almost a half-century of brutal military rule, Christians there are hopeful. However, military rulers have governed with a heavy hand for decades — leaving their mark in a number of odd ways, such as changing the name of the country to Myanmar — yet to be accepted by many citizens. And a recent incident raised doubts as to whether the military has changed. About 300 soldiers from the Army’s Infantry group 438 and Light Infantry group 121 entered the small village of Nam San Yang in Kachin State where separatists are fighting to establish an independent Kachin-tribal state. The troops opened fire over the heads of Catholic church members, Father Jan Ma Aung Li, 49, told a reporter named Panida from the Mizzima news agency. “On Sunday,’ said Father Jan, “we planned to start praying at 8 a.m. But we heard gunfire so we decided that the services should start at 9 a.m. Around 9:30 a.m., the government troops fired at us. We saw their guns aimed at us, so we lay down on the ground, and said we were just civilians. If we did not lie down on the ground immediately, bullets might have hit us. An elderly woman and children cried. The troops “ransacked the whole church,” said Father Jan. “They kicked us and beat us with gun butts. Then we were tied with wire and led away. After we had passed about four houses, they ordered us to carry rucksacks. We said that we could not carry them because our hands were tied. They told us not to run away and they untied us. Then we carried the rucksacks, walking with frequent pauses. We had to walk about three hours. Then we rested at Lawkathama Monastery in Nam San Yang. Fortunately, no one was hurt and the priest and the four other men — Mali Naw Taung, Mali Tu Khay, Ah Wu and Shan man Laung Lu — continued with the troops. 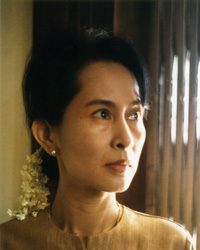 In late September, Burma’s new government released a large number of political prisoners, among them Nobel Peace Prize winner and opposition leader Aung San Suu Kyi, who has been jailed or restricted to her home for decades.